Several objects from our collection reveal a remarkable tale of self-sacrifice and steadfast military discipline during one of the 19th century’s most infamous maritime disasters, the sinking of the troop transport 'Birkenhead'. 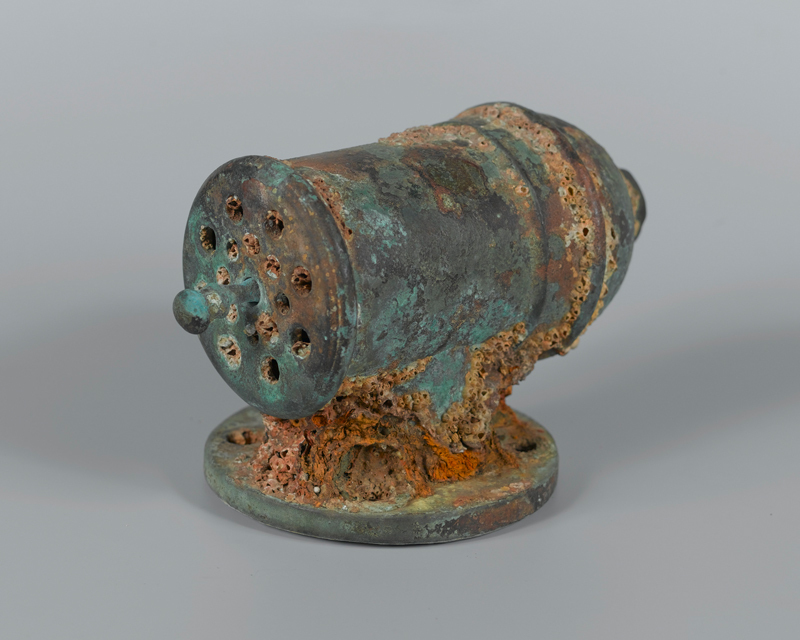 The bilge pump valve below was recovered from the wreck of the paddle-wheeled steam transport ‘Birkenhead’ (1845), which sank off the coast of South Africa on 26 February 1852. Bound for Algoa Bay, she was carrying 480 officers and men from several regiments as reinforcements for British troops engaged in the Eighth Cape Frontier War (1850-53). Besides the soldiers and crew, there were also about 26 women and children on board. As she rounded the Cape of Good Hope in the early hours, the ship struck rocks off Danger Point. Water rushed in through the damaged hull and drowned many soldiers in their hammocks. The remainder assembled on deck or helped man the pumps. Calm order was maintained as the lifeboats were lowered and the troops helped the women and children into them. Two other boats were then manned, but one was immediately swamped and the other could not be launched due to faulty winches, leaving only three boats available for the soldiers and crew. As the 'Birkenhead' broke up, the ship’s commander Captain Salmond shouted that ‘all those who can swim jump overboard, and make for the boats’. But Colonel Seton of the 74th (Highland) Regiment called on the soldiers to ‘Stand fast!’ If they jumped overboard they might endanger the boats, which were still close by. Instead they kept ranks and went down with the ship in shark-infested waters. Many of the soldiers drowned, but some were taken by sharks as they tried to reach the shore or while they clung to pieces of wreckage. A rescue vessel reached the site in the afternoon and found only 40 people still clinging to a section of rigging that remained above water or floating on makeshift rafts. There were only 193 survivors out of 638 passengers and crew; but all the women and children were saved. The incident captured the world’s imagination and King Frederick William of Prussia had the story read aloud to every regiment in his army as an example of supreme discipline, courage and self-sacrifice. 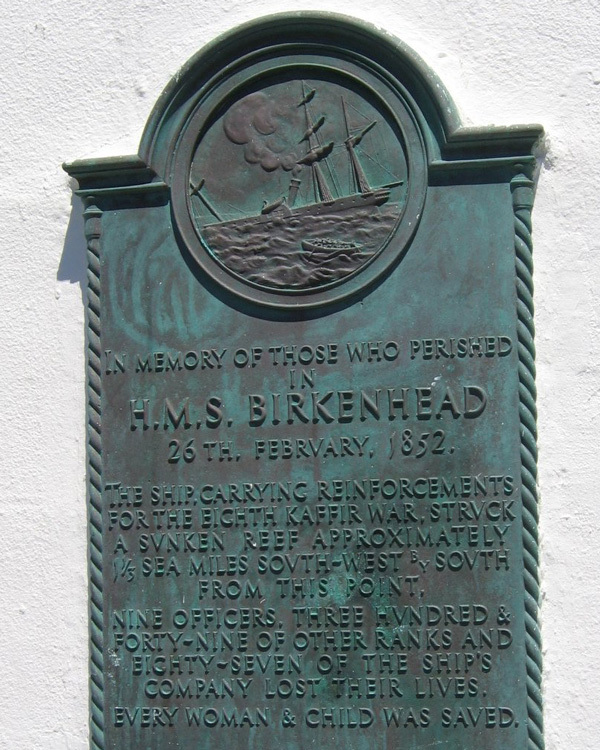 The disaster also gave rise to the ‘Birkenhead Drill’ meaning ‘women and children first’ as a standard procedure during any sinking. 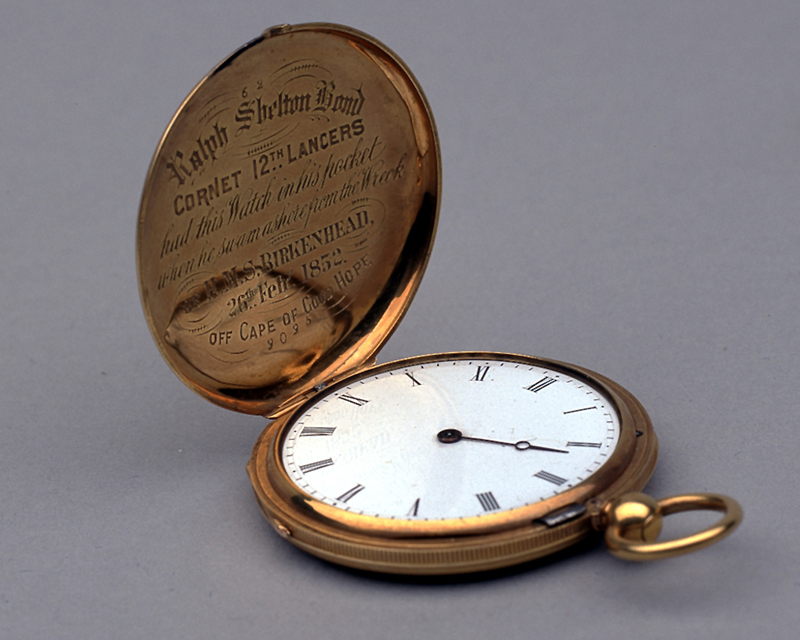 This gold watch was owned by Cornet Ralph Shelton Bond of the 12th (Prince of Wales's Royal) Lancers, one of the few soldiers who survived. He carried it with him while swimming nearly 3 miles (5km) to the shore, assisted by a Mackintosh life-preserver he had privately purchased before sailing. Bond also rescued a distraught child from the ship’s saloon and helped in the attempt to haul out the life-boats. This failed when the lifting tackle jammed. Soon afterwards, the ship started to break up. ‘She cracked in the middle and filled with water. The poop immediately afterwards, owing to the force of the water rushing up, went down, drawing all those who were on it, as well as myself under water. I rose to the surface almost immediately… The sea was covered with struggling forms, while cries, piercing shrieks and shouts for the boat, were awful. I swam astern in hopes of being picked up by one. I hailed one 60 yards off, but could not reach it, as they pulled away, I suppose for fear of too many attempting to get into it. Amazingly, when Bond reached dry land he found his horse. The cavalry horses on board had been freed and driven into the sea in the hope that they might be able to swim ashore. Taking his horse, Bond moved along the coast and encountered other survivors. He also saw rafts on ‘the shore with bodies lashed to them quite dead’ and other washed-up corpses ‘dreadfully mangled by sharks’. So many soldiers were killed by sharks that the locals to this day refer to Great Whites as ‘Tommy Sharks’. Bond and his fellow survivors were eventually rescued. He continued to serve in the army, taking part in the Crimean War (1854-56) and the Indian Mutiny (1857-59), before retiring as a captain. He died at Moy in County Armagh in 1916, the last survivor of the ill-fated ‘Birkenhead’. A trophy worth losing your head for? The Ashanti war trumpet on display in Insight gallery is one of many imperial trophies in the National Army Museum's collection.